Given the best evidence, which by all accounts is very much incomplete, the earliest trombone, called the sackbutt and similar names in England, seems to have emerged from Belgium circa 1450. Though the earliest examples of this instrument date to a century later (circa 1550), direct references to musicians and their instruments, and surviving artwork, both establish the existence of the saxbutt circa 1450. The bells of these earliest instruments terminated in a rimless funnel little wider than 5" in diameter (13cm). Like the modern trombone, these were a tenor instrument, and by the early 17th century there was an alto, a bass and a contrabass version. These early instruments often came with a variety of crooks, to lower the pitch a tone or more, or in some cases to drop the range of a particular instrument to the next register. These early instruments were known to have been used to accompany church music, and to have played parts in bands, though parts for these instruments were rarely scored. The evidence suggests that the players of these instruments read from parts that, though not written specifically for these instruments (or any other), were nevertheless intended to be part of the performance practice of the day. The addition of trombones to the orchestra began in the 18th century, though their most popular role was as vocal support for the sacred music of the church, a tradition which continued until at least the mid-19th century. An excellent example of this type of scoring can be found in such music as Fanny Mendelsson-Hensel’s Oratorio based upon scenes from the Bible. 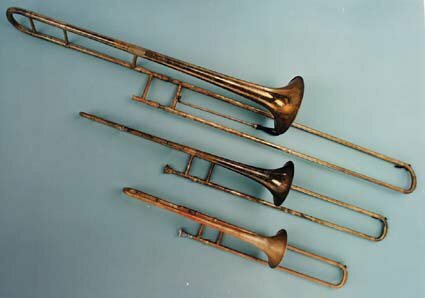 Gluck, Gossec and Mozart wrote passages for the trombone intended to be spiritual or supernatural; Gluck commonly used three members of the trombone family- altos, tenors and basses. By this time, though the role of the trombone in band and classical music was pretty much set, by the end of the 19th century the trombone found itself in the hands of early jazz musicians, in New Orleans, USA. The various types of jazz were: New Orleans jazz (1870's to the 1920's), Ragtime (circa 1890- 1930), what some called the Jazz Era (1910's-1930), the Big Band or Swing Era (1930's- 1940's), the Be Bop Era (1940's- 1950's), the Avant Guard Era (late 1950's), Free Jazz (late 1950's), and Fusion (1960's-1970's). In early jazz the trombone played a more or less functional role, and was usually present as a single instrument. Early jazz bands consisted of a wide variety of instruments, but by the 1930's became more or less standardised, consisting most often of four trombones, four saxophones, four trumpets, and the rhythm section which was made up of bass or tuba, drums, piano, and guitar or banjo. One soloist of particular note, Tommy Dorsey, was the first to play the trombone as a singing, lyrical solo instrument- a far cry from its more Wagnerian association of the previous century. The trombone of today comes generally in five ranges: soprano, alto, tenor, bass and contrabass. Special order instruments, such as the piccolo and the sopranino trombone, are known, though their use is generally relegated to trombone bands. The soprano trombone is often referred to as a slide trumpet, but there are internal differences between the two instruments. The most generic keys for the trombone are or have been: the soprano in B flat, the alto in G, F or E flat, the tenor in A or B flat, the bass in B flat\F, D or G, and the contrabass in BB flat. 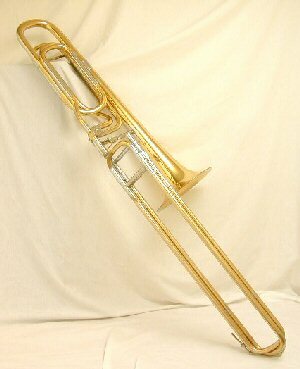 The lowest four voices of the trombone have all been made with valves, including and not including a slide. In the 1870's, Adolphe Sax and other instrument builders made a six-valve trombone, where the six valves, manipulated by both hands, corresponded to the six slide positions. Two-hundred years earlier, the logistical problem in making a contrabass trombone was solved by introducing a double slide, though other less practical versions came with a long handle attached to the slide grip. 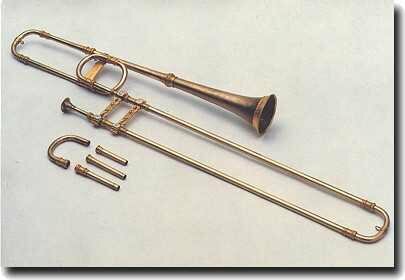 With the introduction of rotary keys and pistons in the early 19th century came trombones that could trill, change register and transpose. 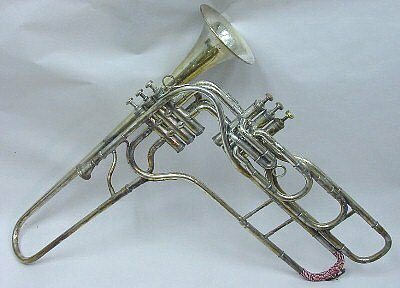 In the 1950's, King (H. N. White, Co.) made an instrument called the “trombonium,” which, while not exactly a trombone, is similar enough to one in bore profile to sound like a valve trombone. The life of the soprano trombone has been patchy at best. It saw wide use in orchestral music in the late 18th century, but was edged out in the 19th century, first by keyed, then valved instruments. The problem of maintaining interest in this instrument lies partly in available repertoire that explores this instrument’s capabilities. The scarcity of this instrument is directly proportional to the lack of effort in creating a repertoire and venue for it. That said, interest in the soprano trombone is rekindled from time to time. It is a little known fact that the soprano trombone was played by some of the top trumpet/cornettist players of the jazz world in the 1920's, such as Freddie Keppard. Louis Armstrong was photographed with this instrument during his tenure with Joe “King” Oliver’s Creole Jazz Band when they were playing at the Lincoln Gardens, though my understanding is that this was a promotional shot. 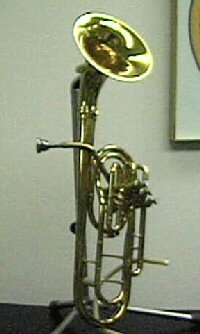 Today, Jupiter produces a cheap version of this instrument under the name “mini trombone.” DEG (Getzen) made a model in the past, and Miraphone is still producing their version. The alto trombone is still used in its original capacity of playing and performing period music, but it can be used to replace the Horn, contralto trumpet, tenor (alto) horn, tenor clarinet and alto saxophone. At present, it is enjoying a tremendous resurgence in popularity, and most of the major manufacturers are now producing alto trombones. The contrabass trombone, though used primarily to play and perform rare parts scored for it, can be effectively used as a substitute for tuba in classical music and period jazz, and bass saxophone in period and modern jazz. The exact etymology and meaning of the term “sackbutt” and it variations is not certain, but is thought to be a derivation of the Old French term, sacquer, “to draw out.” The word “trombone” has meant variously trumpet or large trumpet in German and Italian. 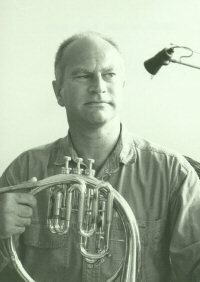 Here are some interesting trombone and brass and wind band links. They have been selected both for their diversity and for the wide overview they provide collectively, for both the present and historically. http://www.trombone-society.org.uk/alto.htm This is one of the best trombone sites on the web, it would be well worth your while to visit their home page and read all their posted material. Their home page is: http://www.trombone-society.org.uk and is called The Trombonist Online.